The New York City-based healthcare organization is one of the largest providers in the city and is regularly recognized as a leader in their industry. With the mission to deliver healthcare services to people regardless of their background or financial circumstances, the organization is dedicated to the protection of their patients’ sensitive information. Given the increasing prevalence of costly cyberattacks, the organization sought to increase their security posture by upgrading their existing firewalls to next-generation firewalls. The US-based global management consulting firm offers a diverse array of services to enable government, non-government, and non-profit organizations to improve their performance. Recognized as a leader within IT and cybersecurity consulting services, their technology solutions enable organizations to scale efficiently and respond to security concerns effectively. Given that healthcare has the highest cost per record breach across all industries, healthcare providers are often motivated by cost avoidance to improve their security posture and upgrade their network security devices. 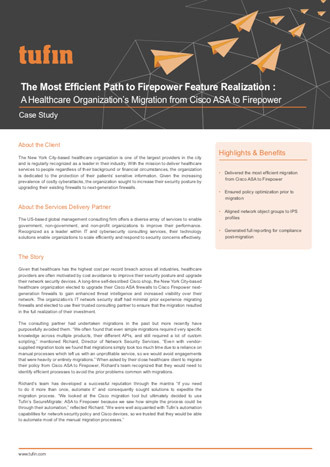 A long-time self-described Cisco shop, the New York City-based healthcare organization elected to upgrade their Cisco ASA firewalls to Cisco Firepower next- generation firewalls to gain enhanced threat intelligence and increased visibility over their network. The organization’s IT network security staff had minimal prior experience migrating firewalls and elected to use their trusted consulting partner to ensure that the migration resulted in the full realization of their investment.